Prime Minister Jacinda Adern is again wooing the world’s media during her trip to Britain and Europe. 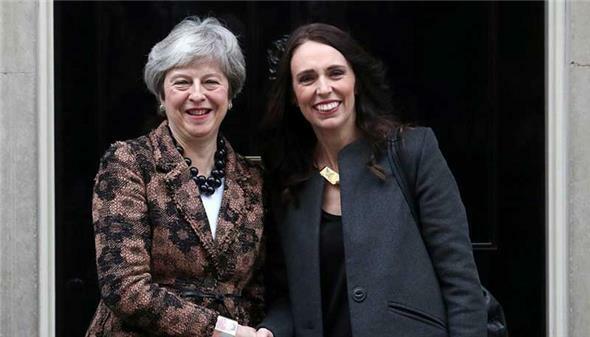 Meeting with British Prime Minister Theresa May, Ardern was the antithesis to the rounded shoulders of Mrs May who is under enormous pressure to secure a Brexit deal before the March 29 deadline. Standing side by side, apart from the age difference, Ardern was positively glowing. And so she should be. A feature in The Times with the stunning headline of “Jacindamania” blazoned across page one. Inside, an elegant Ardern talked about her ambitions, not only for New Zealand, but the world. Not so much world peace in our time, but environmental issues and trade. Much was made of the trade deal she secured with Britain as commentators mused it was pretty much the same as Australia earlier secured. Numerous British High Commissioners to New Zealand have urged exporters to develop deeper ties with British consumers, forgetting for the moment how New Zealand was left unprotected and exposed when Britain looked to the growing markets of Europe. New Zealand looked to Asia, and now China is this country’s largest market in volume and sometimes value. Australia alternates with China on value but not volume. The Prime Minister shared a stage with Sir David Attenborough and another with Prince William to talk about mental health. She had a glowing soft interview on a BBC talk show, charming both the host and the audience. For Kiwis, seeing Ardern on British television and in British papers is as close as they have got to knowing what their Prime Minister is up to these days. An extended holiday break with partner Clarke Gayford and baby Neve have left many wondering where she is. And now they know. Back at home, the adulation is starting to wear off and Ardern needs to come back emboldened with new ideas and some new people brought into Cabinet to help her achieve her aims. After sacking two female ministers, Ms Ardern needs to find someone suitable to elevate in the expected reshuffle early next month. Housing Minister Phil Twyford made an absolute mess of two interviews this week when he admitted the 1,000-house target for KiwiBuild would be difficult to meet. With just more than 30 houses built, getting a 1000 built this year is impossible. He must be shifted to somewhere he can do less damage. Kris Faafoi is an obvious man to bring into Cabinet, except he is a man and Labour has a 50% target for men and women in Cabinet. Ardern could always get rid of a man and it could be Damien O’Connor except O’Connor has been a very steady hand during the Mycoplasma bovis outbreak. Deborah Russell is a new MP but a tax expert who will prove useful during the upcoming tax debates. Labour seems hell bent on a capital gains tax and Russell will be valuable for Ardern in Cabinet to explain in plain terms what the Michael Cullen-led Tax Working Group is selling. Ahead of us, we have a long list of probable strikes. Teachers, doctors, public servants are all lined up to strike, realising that if Labour and New Zealand First only have three years in power, the best worker deals available must be lined up now. Ardern and NZ First leader Winston Peters continue to move apart as far as policy goes. Peters will not be reined in by any Labour minders. That is reality. Trade Minister David Parker was overseas this week glowing over the extended trade deal negotiated by 11 countries, not including the United States. Cynics were quickly pointing out how Parker campaigned against the Trans Pacific Partnership in Opposition. Times are a changing. Ardern had no early option for Cabinet selections. After nine years out of power, Labour, and to some extent NZ First, had little experience on which to call. Some of those experienced MPs have let her down. She needs to find the ruthless streak shown by her predecessors Sir John Key (National) and Helen Clark (Labour) who shed ministers and MPs not pulling their weight. National leader Simon Bridges survived the summer and remains in the top Opposition job. National is still polling at 46%, well ahead of Labour. NZ First has fallen to 4%, meaning it would not be in power. The Greens are close to 5% also. While National continues to poll high, Bridges is safe. This year will be the making or breaking of both Ardern and Bridges. Both have much to gain and much to lose. For Ardern, a new stronger Cabinet is essential to grow support in the centre of New Zealand’s political spectrum. Without picking up some votes from National, she will face difficulty in selling the most mundane of policies. Bridges must not make the mistakes of last year. He needs to start building his popular support while sounding like a leader and prime minister in waiting. The early signs are he understands what he needs to do. In a side note, several press secretaries in Ardern’s office have been told to reapply for their jobs and Bridges’ chief press secretary has left to take up a career in the private sector. For political observers, the year has started well. Theresa May with Jacinda Ardern in London. Photo: Reuters and Newshub.